Before we even get into today’s post, I feel like I need to start with a multi-part disclaimer. Since our adoption announcement, we’ve received so much incredible support. Seriously, through some of the more difficult days, positive words from many of you have given us reasons to smile. But, I’ve also had several “can’t wait to see what happens to your living room” and “interested to see how you handle your home once the baby’s here” kinds of comments. I’m hoping these are coming from a genuine place of challenging me for ideas, rather than secretly hoping I will fail haha. Maybe there’s a little bit of both buried in there 😉 And, while I’m not a mom just yet, believe me, my wheels are already turning and today, I’m sharing a few ideas we’re planning to implement when it comes to organizing, concealing, and storing *all things baby* in the main living areas. NOTE: Most everything in today’s post is on sale for the One Day Premier Sale. Use code THANKYOU for 20% off orders under $1,000, 25% orders $1,000+, plus, free shipping. Something we don’t have to consider as much with dogs though is all that *stuff*. 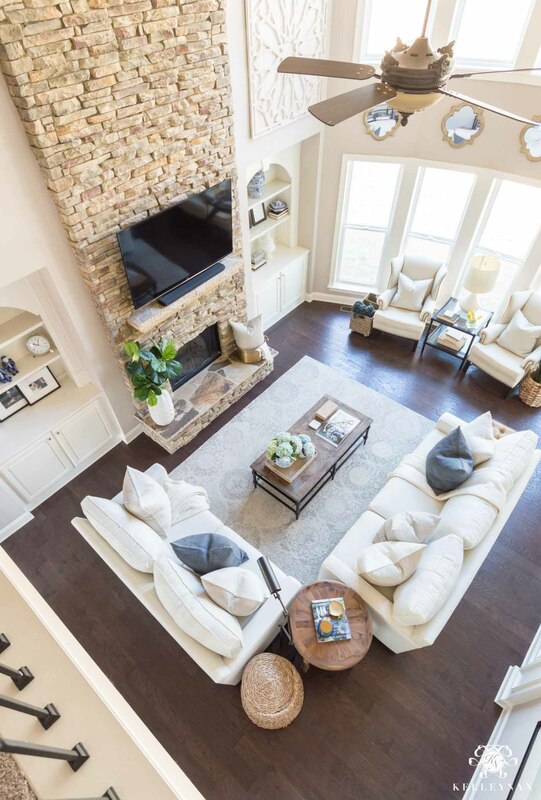 Our bedrooms are on the second floor so we are planning to keep a lot of essentials available on the main floor, in the family room. I feel like it will be a while before we find our flow and I can share how we handle the gear (swing, bouncer, etc. etc.) but in terms of first floor baby essentials, I’ve already landed on a few solutions! The last part of my disclaimer is that as always, this is a judgement free zone and there should be no shame in your baby game! You shouldn’t feel like you have to erase any evidence of your kids living in your home. It’s your (and their) home. You gotta do what works for you. But, like my other organization posts, I am taking on the challenge of coming up with workable systems for our family and am trying to think ahead so when a baby does come into the mix, we aren’t overwhelmed with all the visual clutter. It doesn’t mean we can’t and won’t have it, it will just have a dedicated home. Hiding. In Plain Sight. Would you believe me if I told you that in this photo, there was a stack of diapers, a big packet of wipes, changing pad, children’s books, swaddles/blankets, toys and stuffed animals, burp cloths, socks, mittens, and pacifiers? And no, not in the built-ins (that space is already being used for other things). Everything listed is in fact in this photo; they’re all just hiding. 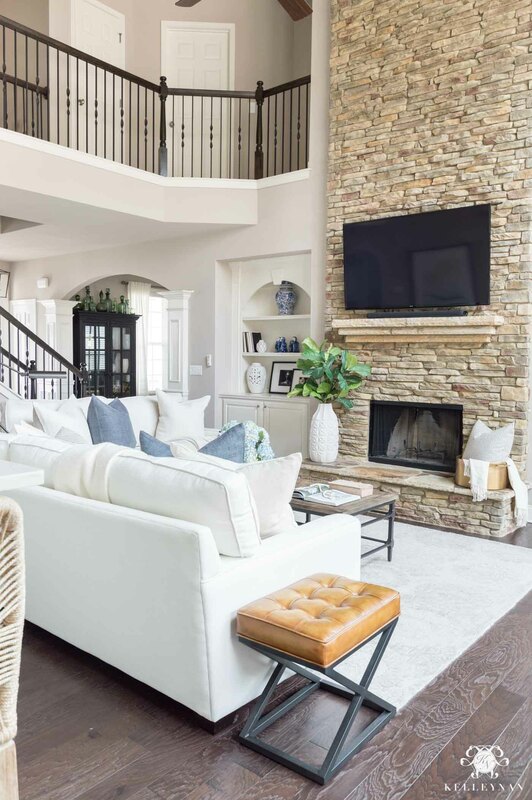 It isn’t always possible (or practical) to bring in large, heavy storage furniture like consoles, dressers and cabinets, but there are ways to adapt without creating an entirely new living space. 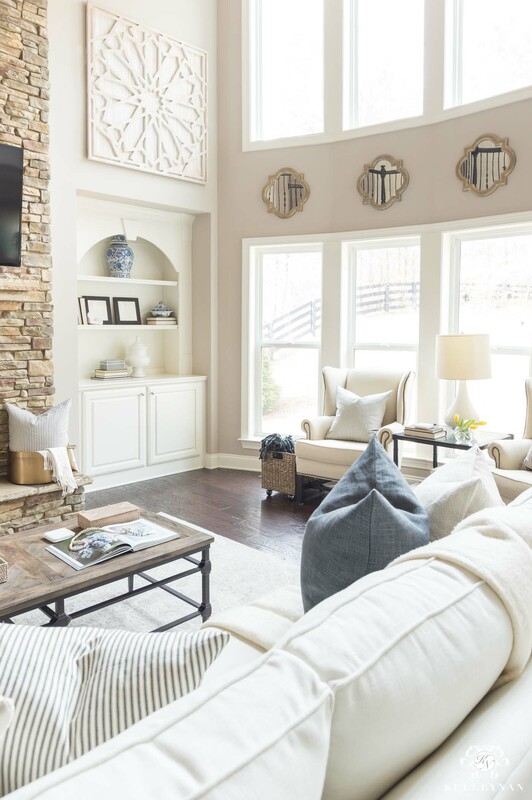 Let’s go ahead and get into it and I’ll share my favorite solutions thus far, along with all the multi-purpose storage items I’ve sourced from Pottery Barn. This is an easy need to address; I can already foresee that I’m not always going to feel like going upstairs to the nursery to change diapers in the evenings. I’m all about convenience and know I want to make space for diapering essentials… but what if you don’t have a cabinet? 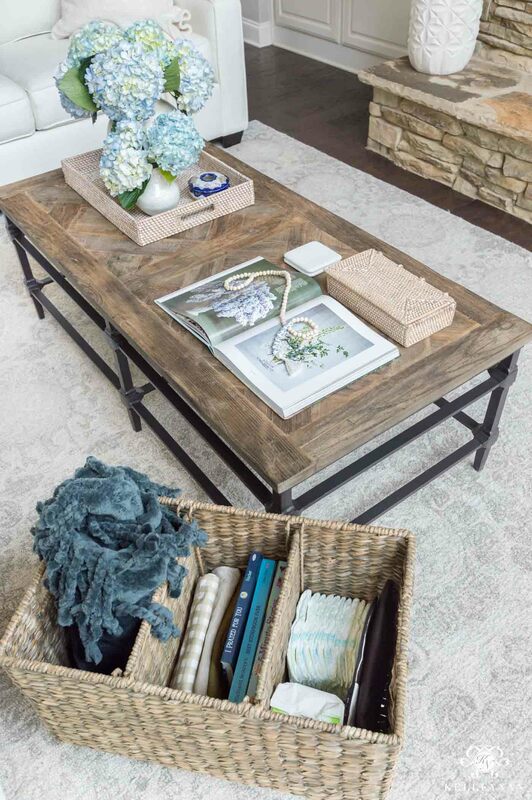 What if your coffee table is open, like mine? I know most baskets that would be large enough to hold everything would become one big jumbled mess in no time. Y’all, I found the perfect mobile changing station; it’s even on wheels! The Charleston Recycling Bin (there are actually several colors and weaves HERE) is sectioned into three compartments; each divider can be removed for more/less space. 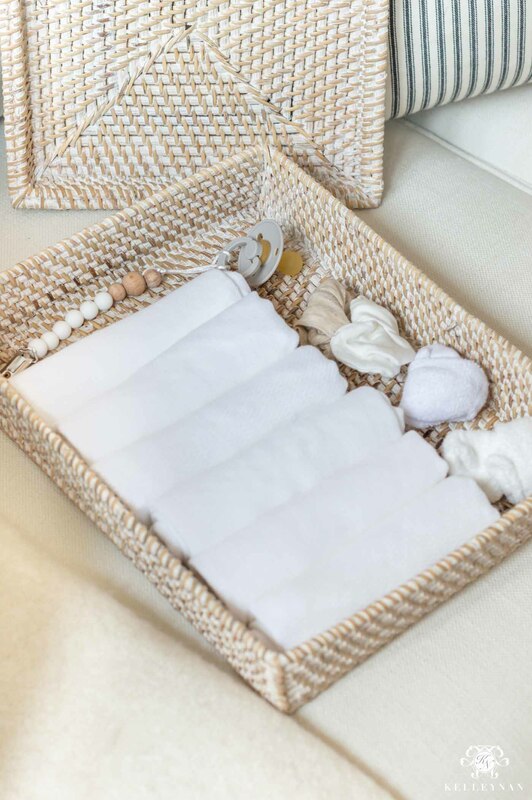 It’s the perfect basket to be able to use and to actually organize the contents. 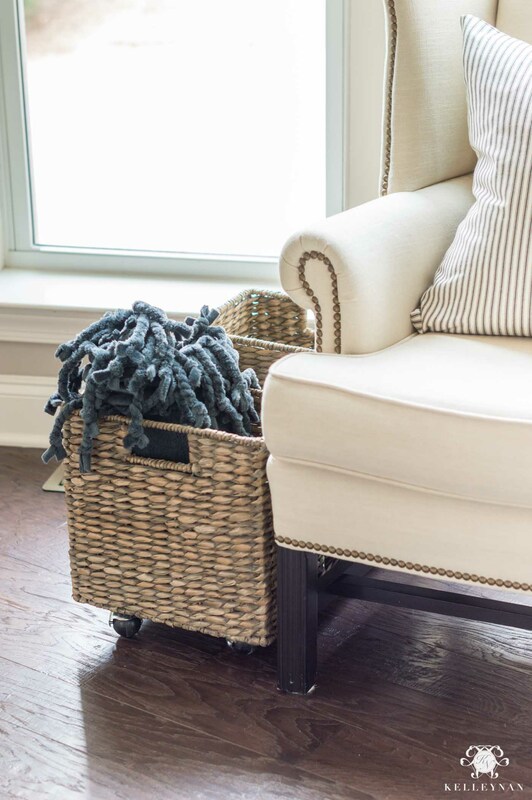 And a major perk- I can use the front portion to hold throws/pillows, just like my previous blanket basket, to help conceal that its purpose is anything more than to house cozies. It’s also deep so you can’t see anything unattractive peeking out from across the room. Here, I have one section holding a portable changing mat, 10 diapers (it could EASILY hold WAY more), and a big container of wipes. In the next compartment, I have a few large books and lightweight swaddle blankets. Again, these dividers can be removed if you want a single big compartment, big compartment and slim compartment, etc. And, if you don’t have children, this is still an awesome solution for stashing your laptop in the living room, or with older kids, coloring books and crayons… maybe you knit? Seriously, so many possibilities. While some things are better organized, others just need hidden storage. 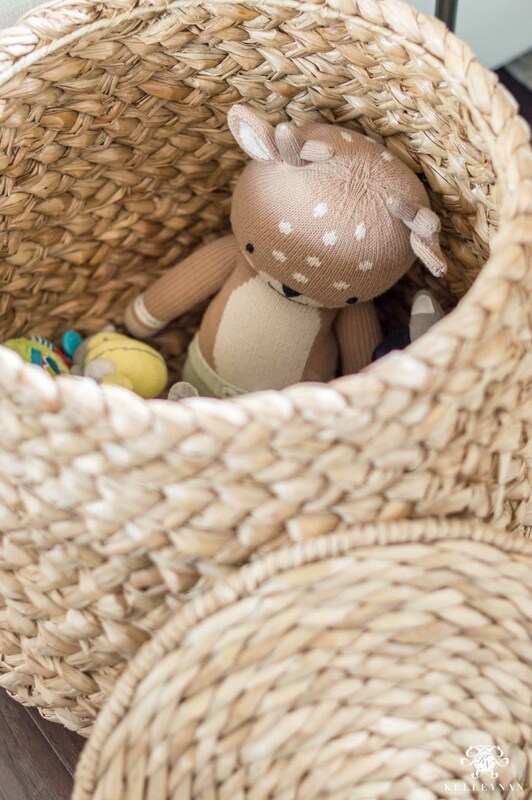 This lidded tulip basket (HERE) is a longtime favorite and perfect for a casual toy dump. It’s a great shape nestle up to a side table, chair, or stand alone in a corner. It’s attractive enough to even be placed on the fireplace hearth. 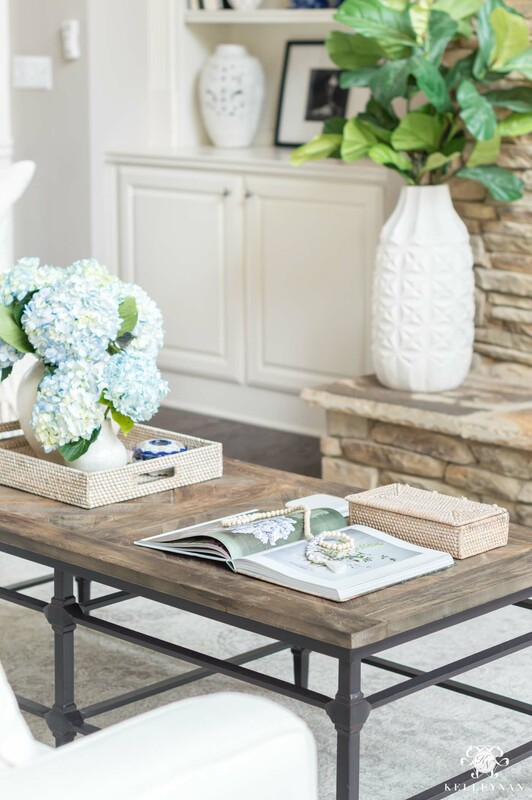 We love our coffee table (HERE) but storage ottomans are another great option; you can even use small storage ottomans in pairs or by themselves — under a console table, in front of a chair, next to a wall, etc. Good bookshelf/tabletop baskets aren’t easy to come by and I have an even deeper appreciation for them now. Full disclosure, until now, most of mine have remained empty! Before coming up with solutions, I first made a list of the items I *thought* I would need to come up with a solution for. 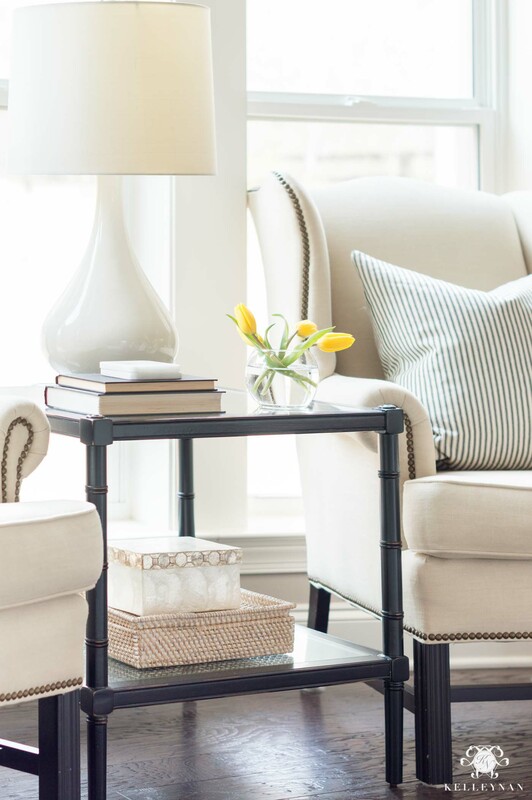 There are a lot of little things I think I want to keep accessible in the family room and I found some stackable lidded baskets that are the ideal size. 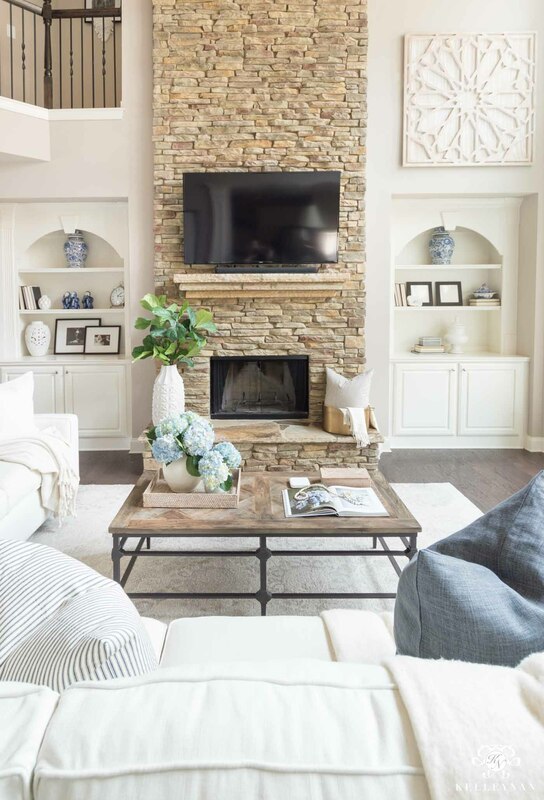 Getting the right size is important — too small and you’re spreading all the items out and stashing them all over the living room (how will you keep up?! ), but too large of a basket, and it will likely never be truly organized. The lidded document tray (HERE) was perfect for what I was looking to store. 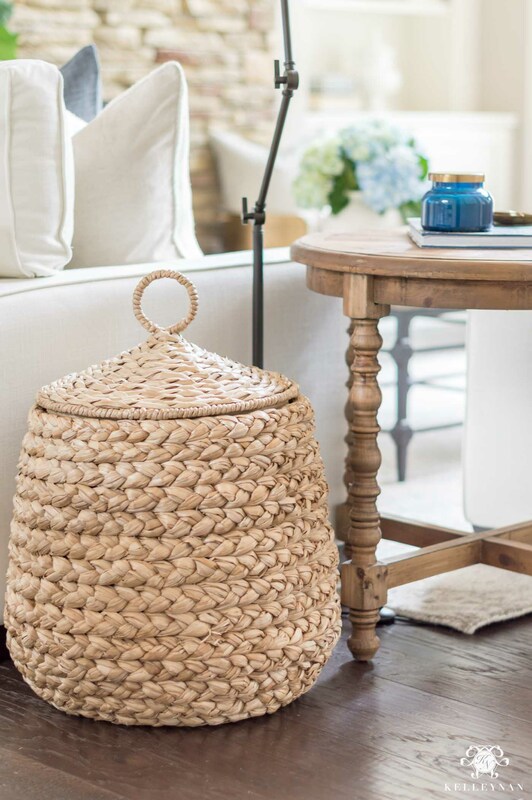 Pottery Barn carries a lot of my favorite baskets but I’ve been a big fan of their bathroom lidded baskets (designed to hold toilet tissue) for years. 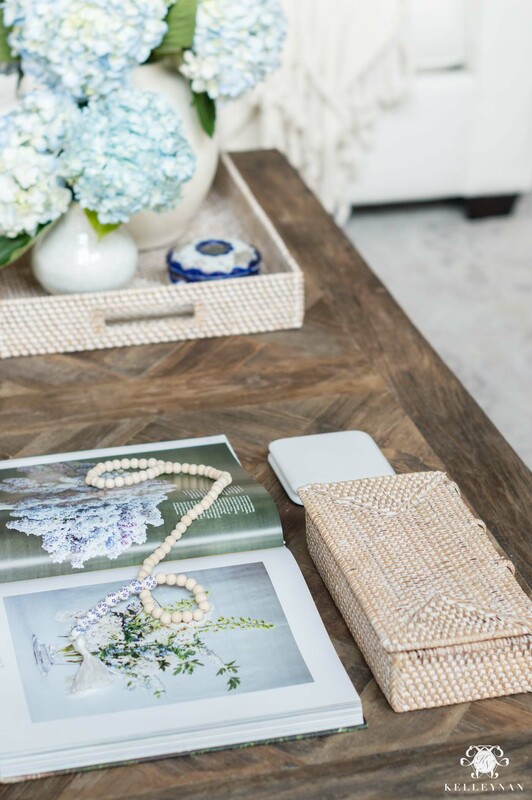 In addition to being the perfect, stackable catch-all organizers, they are one of my bookshelf/table styling go-tos. And speaking of small baskets, this last nugget doesn’t pertain to kids but is too good not to share. 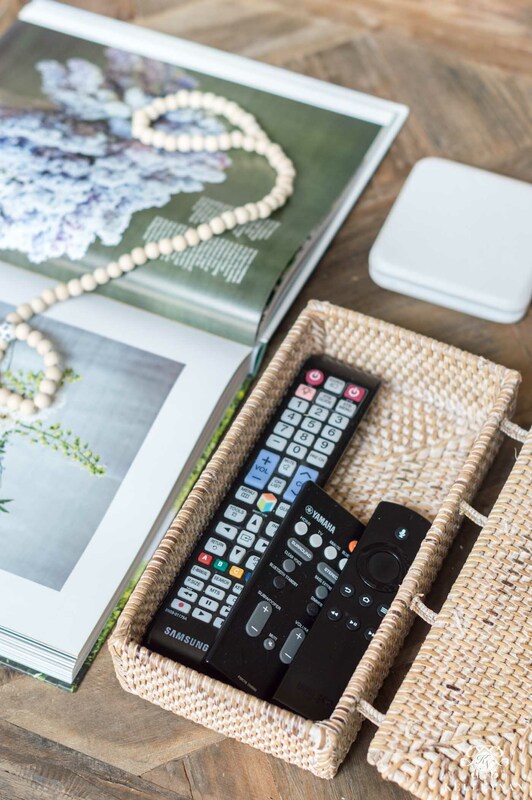 I think this little desk rectangular box needs to be re-marketed as “remote control holder” because it’s seriously the best one I’ve ever found. 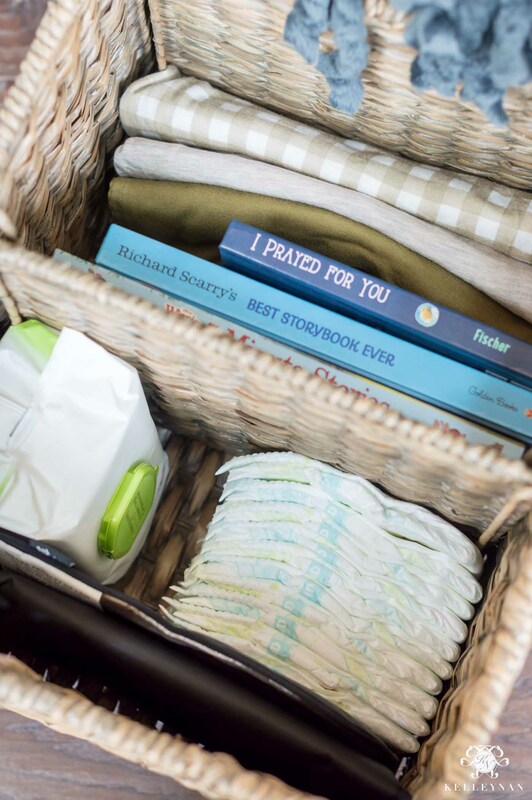 If you’ve landed on any favorite ways to stash baby/kid items, let me know in the comment section below! I have a lot to learn and experience and I can’t wait for it all! As always, I so appreciate your grace as I do work to figure things out 😉 I still do have an FAQ (re: our adoption journey) coming soon and there haven’t been any announcements. ;To see more organization, adoption, kid stuff, home projects, or upcoming room makeovers and entertaining ideas, subscribe to my emails at the bottom of the post! I can’t imagine anyone would wish failure on you!!! It is all going to be awesome. I used a wicker tea cart in my dining room as a change table on wheels. LOL. Everything was neatly placed in baskets and it worked perfectly. I had my handy hubby change out the glass. I covered a pc of wood with foam and material that matched the decor….it was totally incognito!!! When that fails….as …trust me…when you’re in a hurry it will….laundry baskets are the bomb!!! Stick everything in them….including a sleeping baby….lol. A wise woman I worked with once told me that children will live up to whatever standards we set for them. We had white furniture and creamy carpets throughout the house and it was never a problem. Even his friends whose parents didn’t expect them to behave or respect their homes came over and were a joy to have around. There was no problem because we were all respectful of not only each other, but our home. People who allow children to just run wild and not respect anything or anyone make it very hard on their children. I’m not in any way saying we were strict or rigid — far from it and all of my son’s friends loved to cover over (and most wanted to live with us)!!!! 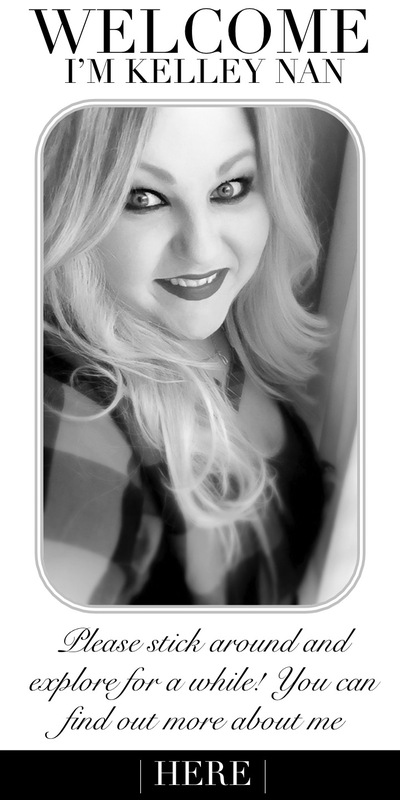 Jayne! I LOVE THIS! You are so right and this is how I was raised too. I’m not a parent so I don’t have much personal experience to speak from or advice to offer but I believe this so hard and am hopeful that this can be our reality. Thank you so much for taking the time to share!!! Great ideas!! I have four kids and while we def have clutter around sometimes you’ve already figured it out. If things have a place, they’re much more likely to get there! Jill, this is so encouraging! Thank you for sharing your experience! DON’T let anyone discourage you about Anything! Any new Mother will tell you.. it is a day to day joy & the toughest job you will ever have! You learn new tricks as a Mom every single day.. So will you! Sooo excited to be introduced to your new baby whenever that is.. I wish you all the happiness ! You will be a pro.. just like you are in all your posts.. Just Excited so much for you!!! Great ideas! For those that make comments about how your home, a specific room, etc., will look, I say, don’t worry. 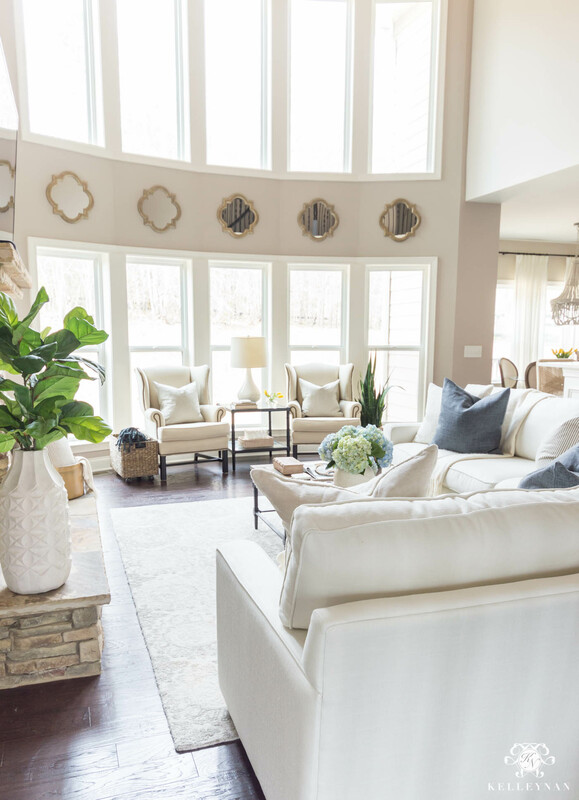 I’ve had three children and your home does not get destroyed if you’re organized and have the kids play in a certain area and as crazy as it sounds…outside!!! My kids played in their rooms, outside, etc. They didn’t drag their toys all over and when they were old enough, participated in the clean up. Will you be tired, of course, will there be some days you don’t want to clean up, absolutely…so what!! Enjoy your bundle and have a wonderful life. Kelley. 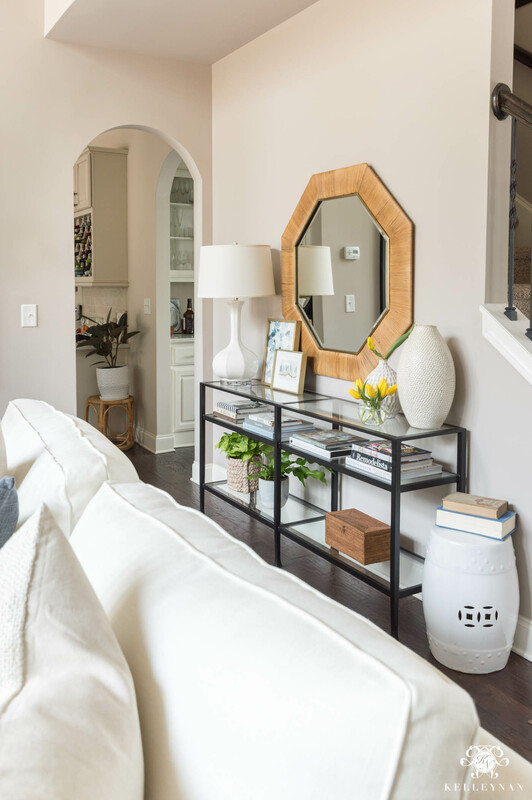 I think you’ve come up with some incredibly awesome ideas to stylishly keep things tidy in your gorgeous home. You will find as parents you won’t care nearly as much about tidiness, too – because that bundle of love’s arrival to you will be all that matters in the world!